Since 1971, Toms River Door & Window has helped Jersey Shore homeowners update their homes by installing top-performance vinyl replacement windows. Built by Sunrise, an industry-leading manufacturer, our vinyl house windows are the ideal solution for coastal homes that need strong, durable windows. Crafted from non-recycled vinyl, Sunrise replacement windows are a cost-effective option that doesn’t lack in quality. The low-conductive vinyl frames and other energy-saving features prevent heat from escaping your home in the winter and sneaking in during the summer. This creates a more comfortable interior temperature and could potentially help you lower your monthly energy costs. Sunrise Restorations replacement windows feature durable vinyl frames that are reinforced with fiberglass for ultimate protection. This hybrid design allows you to enjoy the high-performance durability of fiberglass combined with the maintenance-free benefits of vinyl. Toms River Door & Window is known for quality, and our installation technicians are no exception. All of our installations are completed by factory-trained and -certified in-house technicians – never subcontractors – so you can be confident that your window replacement will be handled by skilled and qualified professionals. 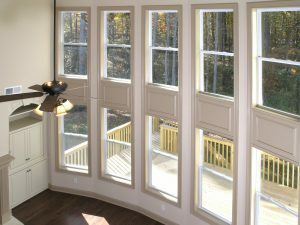 To learn more about the benefits of having Toms River Door & Window install Sunrise replacement windows in your Jersey Shore home, contact us today. We’ll be happy to schedule a free, no-pressure consultation, and we also welcome you to visit our showroom, conveniently located just off the Garden State Parkway.